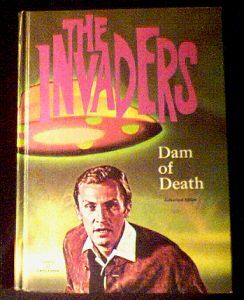 Whitman tv adventure novel featuring Roy Thinnes as David Vincent on the cover. Book is in like-new condition. Solid binding. This was one of my favorite sci-fi shows in the sixties. Sort of X-files-like, though Vincent was not a government agent, but just a regular guy who sees an alien spacecraft land, and spends the next two seasons trying to convince the world that "we are not alone." Usually, when he would finally convince someone of the alien threat, that new believer would be dead by the end of the show (sort of like a red shirt on Star Trek - certain death to those who wear them). Website design and hosting by Sohodojo Business Services. Item 430 of 466 items displayed in viewer. 0 items in cart.